We arrived in Sapa on such a heavy rainy day and we finally found a very nice boutique hotel called Sapa Rooms Hotel. We put everything in there, took a quick shower and went out for breakfast and shopping. I suppose it sounds a bit crazy to go shopping in the rain but I quite enjoyed it and I wasn't the only one! 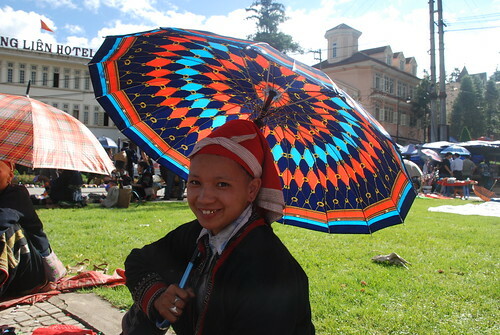 The ethnic minority sellers speak English very well but they do tend to be a bit pushy but I understand why. They followed me for a long way until I bought something from them. I was trying to ignore them but they kept asking me about a million times so I had to talk to them for a while and finally bought some small things from each. This handmade stuff isn't expensive at all and very beautiful. I bought about 6 blankets, a few H'mong hats, wristbands and a necklace.... I hope the sellers were as happy with my purchases as I am. 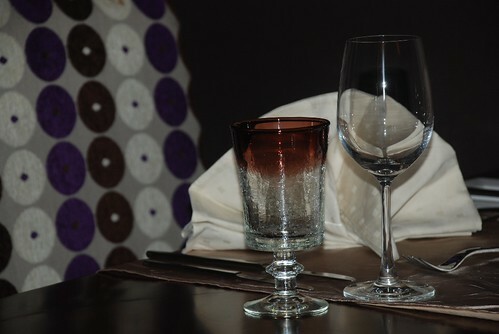 We had lunch at Mimosa restaurant in Cau May street. 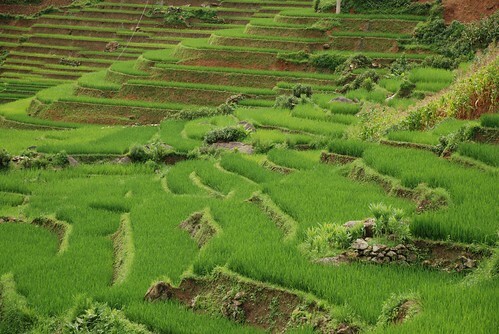 It is a very nice, cosy restaurant which I always go to whenever I am in Sapa. It's not very expensive but I love the atmosphere, which is casual and friendly. We ate quite a lot and I love the grilled venison, grilled pork, Sapa veggies and the sour broth. 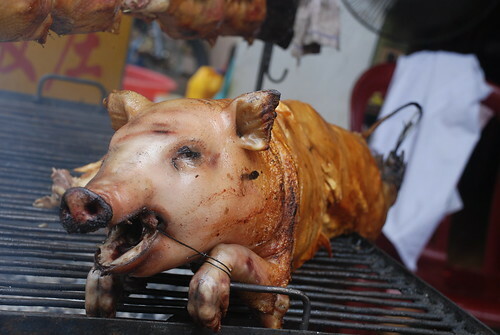 We only paid about 100,000 VND each, which is an amazing price for the amount of food we ate! The next day was a really beautiful day in the afternoon in which we took a long walk down to Cat Cat village to take more photos and do a bit more shopping. After all the rain, it was great to see the blue sky against the white clouds, everything looking very clear and clean. I really appeciate this natural beauty. 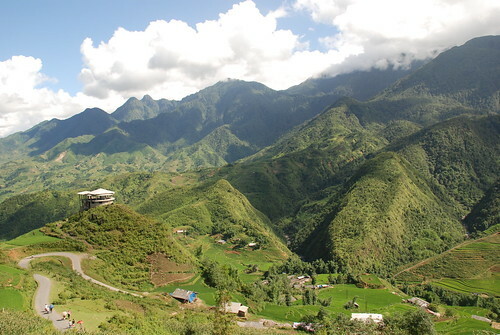 I think Sapa is a nice place to come for this purpose. We left later that afternoon and on the way down to the train station at Lao Cai, we saw a bus on fire with only the frame and ashes left. I was a bit worried as on the way up, as we got stuck for almost an hour due to the rain and crazy traffic. Our bus couldn't move as we were bogged in the clay and many people just tried to get around us which was a night mare. Luckily, this road is under construction and a man driving the road digging machine came over and helped us to solve the problem. Anyway, we arrived at the station on time and had dinner before the journey back to Hanoi and the heat. I hope it's going to rain tomorrow. 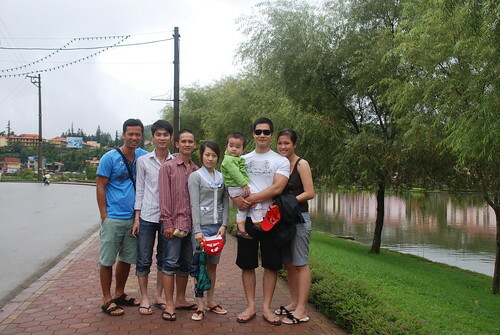 Thanks to the hotel staff and my friends for giving me a great time to discover Sapa once again. Going back to Australia is so exciting as there is still so much more to discover. It is such a huge country and it is pointless to go there for just a few weeks. I hope I can see more of the beauty of Australia. 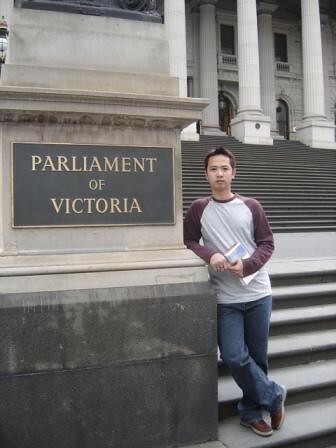 Today I went to IOM, an agency which processes all visa applications in Hanoi, to apply for the visa for my trip. Everything seemed to go well except there was a heavy storm and I didn't bring enough money. Luckily, another applicant lent me the rest to pay the fee before I ran down stairs and down a few blocks to withdraw money to pay her back. I was so thankful for her generosity. Thank god she helped me or I would have had to go back the next day. I hope my visa will be available in two weeks. Wish me luck guys!!! 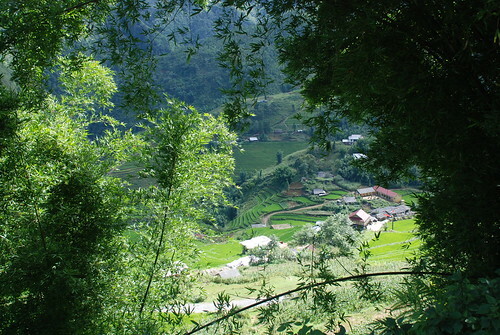 I am going back to Sapa with some friends to escape the heat of Hanoi for a weekend. It's been a nightmare to get tickets as we wanted to get a whole cabin on the train for six of us. My friend spent a few days trying to buy these train tickets but he found it impossible. He asked his friend to book through an agency to get them and we paid extra for thisspecial service. It's annoying that no legitimate tickets are available but the black market has plenty of different kinds of tickets and they are very expensive. 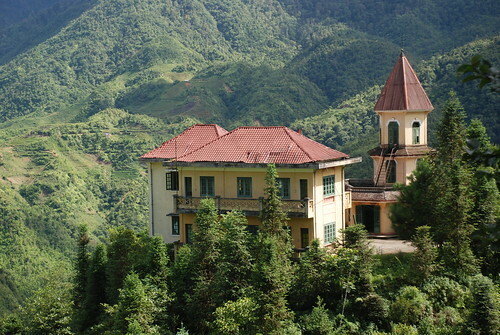 I called a few hotels in Sapa yesterday but they are full or really expensive. We have decided to stay in a guest house with a good deal. 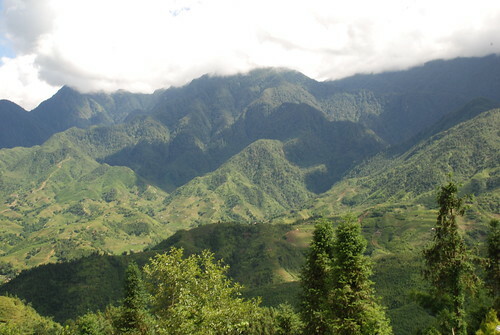 In 2007, we went up there and we also stayed in a guest house and it was fine, clean and only $7. I hope I can get the same deal this time instead of paying $25 or $35 for a double room. 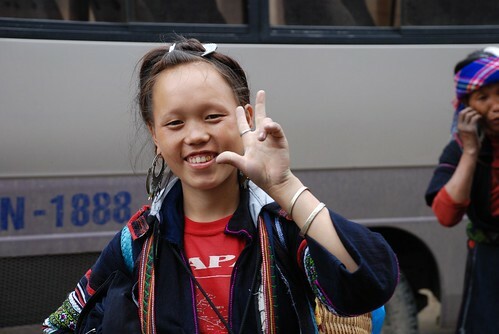 One hotel receptionist told me that about 10,000 people went to Sapa last weekend and it would be the same this weekend. Bloody hell, I hope it won't be that crowded or I will have to stay in the hotel the whole weekend. I will get back to Hanoi on Sunday with some news about my trip and would probably share some photos as well. The mangosteen is an exotic tropical fruit with luscious segments of white flesh inside. The Movenpick Hotel has taken inspiration from this fruit in the naming of its restaurant, which is located on the second floor with views across some of Hanoi’s fine French Colonial buildings. The space is artfully decked out with walls the colour of mangosteens, splashes of purple in the furniture upholstery and the modern paintings on the walls. 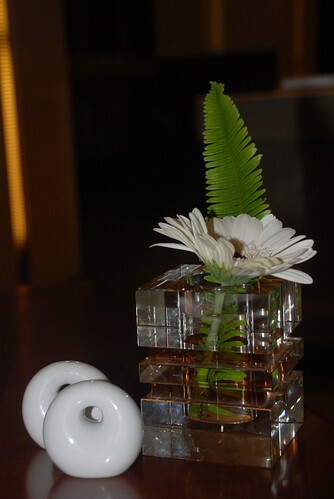 The table setting includes a glass cube vase containing a single white gerbera and a green fern frond. The décor promises much. And the menu offers a range of choices that would satisfy most diner’s palates. 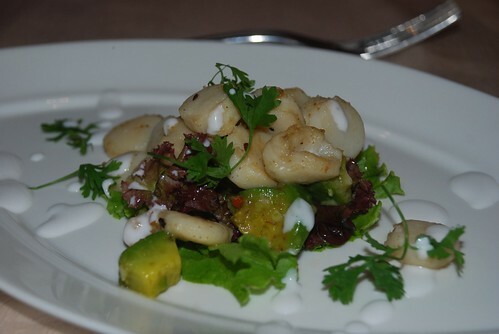 For our starters, we opted for the seared scallops served atop a delicate fresh garden salad of lettuce, herbs and avocado and a swiss chicken salad, rich and sweet with cheese, apple and a mayonnaise dressing. The portions, on teardrop shaped white plates, were perfectly sized which we appreciated later when our main courses arrived. A generous selection of breads, including some great salty pretzels, was served on the side. We probably ate too many of those. From the grill we selected our main courses, which were served with potatoes and vegetables done to the customer’s liking. 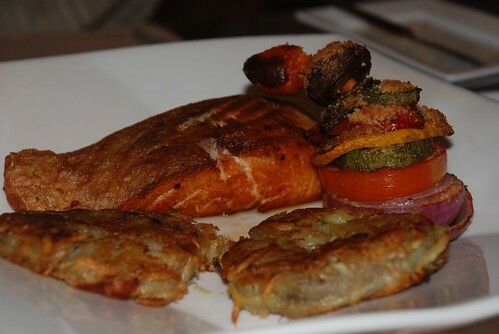 Accompanying the salmon was a neat stack of crumbed roasted vegetables and crispy potato rosti along with a ramekin of creamy lemon sauce. 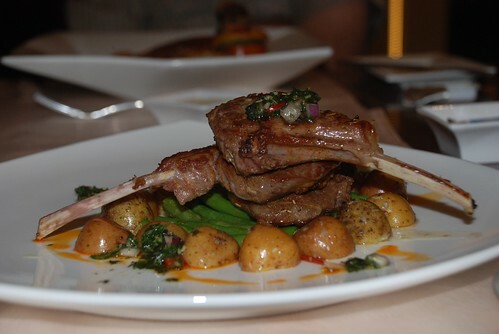 The stack of lamb cutlets got delivered on a flat raft of spring beans and came circled with halved new potatoes served face down. A herby mint sauce with a hint of chili finished the dish nicely. The kitchen staff should be commended for the timing, temperature and presentation of these meals, all of which were spot on. Suitably impressed by this stage, there was little need nor room in the stomach for dessert. So we rested for a while to make room. Room for big desserts with a distinctively European feel. 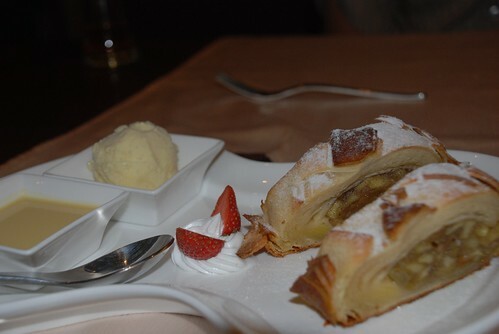 A king size serve of apple strudel came with homemade vanilla ice-cream and cream while the vanilla soufflé contrasted with the raspberry coulis alongside it. Every single mouthful was savoured even though we were both full to bursting. The Swiss do hospitality well, with the local staff representing them professionally with service that was warm, efficient and hardly noticeable. Movenpick’s venture in Hanoi appears on the way to success if our meal at their classy Mangosteen restaurant is any indication.